Why Am I So Pissed Off? My family should be a two-car family but we’ve been putting off buying a second car. So, I ride a motorcycle to work and basically every else I go. Sometimes the ride is relaxing, but all too often I have some “close calls” during the ride and I find myself arriving where I need to be feeling stressed and angry. Someone on the freeway suddenly tries to move into the lane I am occupying without using a turn signal and without looking. I have space to move over, but just barely. I almost wreck at 80 miles per hour. My heart is pounding, I break out in sweat, and the emotion that I identify is anger. It seems so immediate, so visceral, so primary. I feel it in my gut, my chest, and my hands. As men we’re socialized to restrict and repress our expression, even our experiencing of many common, biologically determined emotions. The softer, more vulnerable emotions, like love, sadness and fear we are implicitly taught to associate with femininity. We are taught that femininity is weakness. We’re taught that weakness in men is shameful. We’re told that boys don’t cry. So when the normal human emotion of sadness arises in response to some loss or trauma, we experience shame and anxiety around that forbidden emotion and we suppress it. For men, the emotions that are socio-culturally encouraged to experience are the harder emotions like excitement, sexual excitement, and yes, anger. This explains why my response to almost getting killed by an inattentive driver on the freeway is to get pissed off. If I take off my helmet, put on my mindful man hat, and sit with my anger for a while, I start to realize that there is another emotion rumbling around that I am less comfortable with. The biologically predetermined emotional response to almost getting killed, the response that is chemically and organically dictated by the neurotransmitters released into our brains and bodies, the “natural” response to almost dying is fear. Our message to men is that fear is weakness, and weakness is shameful. This message is so powerful that my own ego tries to override the fear response that I’m having because of my nearly fatal commute. What I describe as “feeling stressed and angry” is my ego working against my body and my brain to suppress that softer emotion because, in our culture, it’s better for a man to be pissed than scared. Emotions contain energy that can be felt somatically in the body: the thumping of my heart in my chest, the tightness I feel in my belly. The energy contained in an emotion psychologically manifests as a drive to act, in AEDP we call this the action tendency. The action tendency of the softer emotions tends to be toward connection and comfort. If we let it, love compels us to act with compassion, to care for others, and to commit our lives to doing that for someone. If we let them, feelings of sadness drive us to seek solace in the arms of one who loves us. If we let them, feelings of fear force us not only away from the source of danger, but toward a person of safety. The action tendency of anger, particularly anger that is defensive, anger that covers another emotion is to act out, to strike out, and to push others away. This is perhaps the most compelling argument for why men should allow ourselves to dip our toes into the emotions we feel less comfortable with. In the series of articles that follow, we’re going to explore men and our experience of emotions with the intention of becoming our more authentic selves and expanding our capacities to experience the full range of human emotions so that we can live more wholeheartedly and engage more fully with those we love. We’ll make some distinctions together between fearlessness and bravery and between weakness and vulnerability. 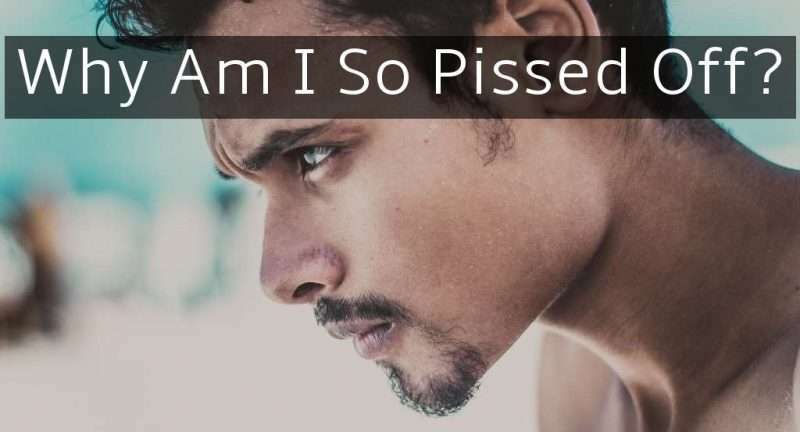 In today’s article we explored one of the phenomena that help us answer the question, “Why am I so pissed?” In the coming weeks, we’ll explore what we can do about it. We’ll talk about how we can differentiate anger that is defensive from anger that is a true core emotion. To help us do that, because men like tools, I’ll introduce Hillary Jacob-Hendel’s Change Triangle, a powerful tool that I use in my own life and in my work with patients and couples who want to understand their own emotions and their partner’s emotions better.